Jeff Beck is a true rock legend. From his time with the Yardbirds in the sixties, through the Jeff Beck Group and throughout his solo career his unique guitar style and constant desire to explore new musical areas and sounds has won him the admiration of his peers and the adoration of legions of fans. In 2007 Jeff Beck performed a series of concerts at the renowned Ronnie Scott's club in London. They became the must have ticket of the year with a packed audience every night of the famous and the fans. This CD features performances recorded across the different nights and presents the best version of each track. 2008 release. Jeff Beck is a true Rock legend. From his time with the Yardbirds in the '60, through his solo career, his unique guitar style and constant desire to explore new musical areas and sounds has won him the admiration of his peers and the adoration of legions of fans. 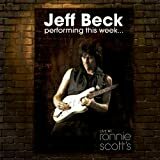 In 2007 Jeff Beck performed a series of concerts at the renowned Ronnie Scott's club in London. They became the must-have ticket of the year with a packed audience every night filled with the famous and the fans. This CD features performances recorded across the different nights and presents what Jeff Beck considers the best version of each track. For these performances, Beck is joined by Tal Wilkenfeld, Vinnie Colaiuta and Jason Rebello. 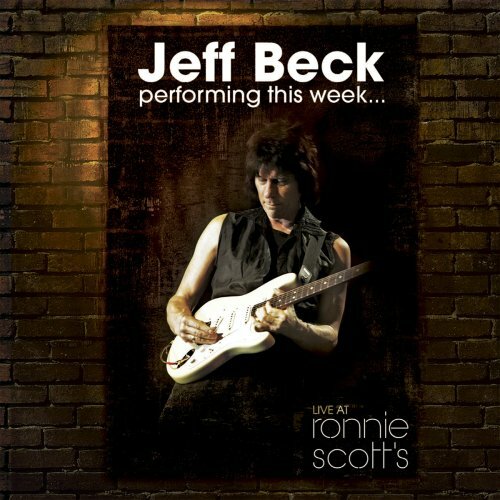 Features classic tracks from across Jeff Beck's career including: 'Beck's Bolero', 'Led Boots', 'Scatterbrain', 'Where Were You', 'Angels (Footsteps)', 'Cause We've Ended As Lovers' and his now iconic version of 'A Day In The Life'. 16 tracks. Eagle. After Live at BB King Blues Club and Official Bootleg USA '06, two live releases from Beck that were expensive and varied in quality, it's definitely an early Christmas present to receive a new, reasonably priced, and consistently hot live set from this king of the stings. The expected tracks are here, and the set list mixes it up enough so that even if you do own the other two live CDs, you're not getting a "re-tread" here. Beware! Missing tracks! Go for the DVD instead! This applies to the CD. The following tunes on the DVD are NOT on the CD or MP3 version of this album (They apparently cut all the "guest appearences"). That's at least 20 minutes of music, and the most interesting parts of the show. What you're left with is largely a rehash of Jeff's fusion instrumental tunes from the late '70's and the '80s. On the other hand, "Blanket" is a great track - It's nice to hear Beck with new material. A whole live album of fresh tunes with Jeff, Imogen, and the great backing band would have been much more interesting. Everyone has a favourite: guitarist that it. Mine has always and forever will be Jeff Beck. The most accomplished instrumentalist that few people have heard of. From the earliest days in the Yardbirds, through his first band with Rod Stewart on Vocals, Ronnie Wood on Bass and Mickey Waller on Drums Beck has laid the foundation for virtually every genre of post Beatles rock. This live recording takes early cuts like Beck's Bolero - (written by Beck and Jimmie Page) and which featured a manic Kieth Moon on the original recording and demonstrates in stark relief where and why Beck's talents lay wringing, wrestling, cajoling and seducing guitar sounds that none have ever been able to emulate. Yes many will claim Hendrix was the innovator - but for those in and around the London Clubs of the mid 60's they will have noticed or even remember nights when Hendrix would watch Beck; some have even recalled Beck and he jamming late into the night. Once Beck had tired of "plank-spanking" (post Beck, Bogart and Appice), Beck hooked up with George Martin and took on what is now known as Jazz-Rock. Beck plays today fusing jazz, rock and an electro/techo style all his own - and does so with a free rein. Even the Beatles Day in the Life displays a musical understanding which leave most observers breathless - or may be that might be speechless. All I can say is,if you are a Jeff Beck fan,run,don't walk to get this CD.Jeff has topped himself with these live tracks.When I heard this,I thought I was gonna drop over on the floor,and die happy! Enjoying the Jeff Beck cd. I'm a huge Jeff Beck fan. I've seen him live 6 times. Two summers ago, I was at the Eric Clapton Guitar Festival and very pleased with this group make-up performance; and they deliver another strong performance on this cd. Highly recommended. I've had the pleasure and honor of seeing Mr. Beck perform twice. Once in 2000 and last week at the new Boston House of Blues. Both times were just unbelievable,jaw-dropping performances. This live cd captures his outstanding and out-of-this-world playing. Backed by the talented Vinnie Colaiuta on drums, Jason Rebello on keyboards and last and certainly not least, Tal Wilkenfeld on bass. Remember Ms. Wilkenfeld's name. This young, 23-year-old from Australia is a very, very talented bass player. All his great songs are here, from Beck's Bolero to Led Boots, to the Beatle's A Day in the Life, which is just phenominal and my favorite Beck song Where Were You and many more. If you've ever seen Jeff in concert this a great keepsake and reminder of how great a guitarist he is and if you haven't this will make you want to go out and catch him live. The Guv'nor does it again. Beck has been consistently the most interesting and original guitar player in rock since his Yardbirds days, though sometimes held back by lacklustre material. Whereas many of his peers have been resting on their past glories, Beck has been on a constant and continuous development path, even reinventing the way he plays his guitar. He now stands in a category by himself, coaxing impossible sounds from his guitar that give a vocal quality to what he plays. The tracks on the CD cover a lot of ground in Beck's career and a lot of musical ground: rock, blues, jazz, fusion, reggae etc.. all meld into a musical whole and are made his own. He is aptly supported by his amazing regular band, Vinne Colaiuta, Tal Wilkenfield and Jason Rebello.